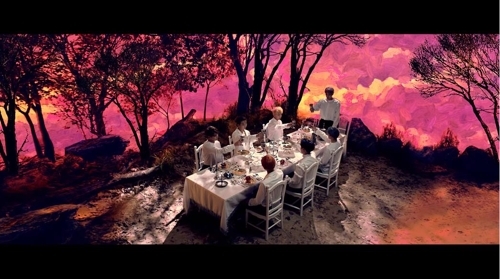 A French photographer and writer has claimed that a banquet scene from BTS’ 2016 music video “Blood Sweat & Tears” drew inspiration from one of his photos, his local agency said Monday. Bernard Faucon sent a document containing the claim to BTS’ management agency Big Hit Entertainment in August and October. 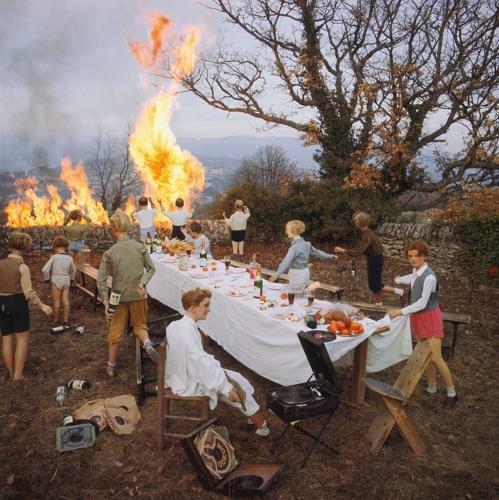 According to Faucon’s agency here, the document also claims that his photograph “le banquet,” taken in the 1970s, must have been a reference for the filming of the banquet scene in “Blood Sweat & Tears,” which shows the septet having a formal dinner surrounded by flames engulfing a hill. The French photographer also claimed that the photo book of BTS’ album “Young Forever,” released in May 2016, also took images from his other works. “It’s clear that (the photographer) brought my photo collection ‘summer vacation’ to the shooting scene and referred to it while taking the photos,” he was quoted as claiming. Big Hit responded to the claims by saying that the BTS photos and music video do not constitute any copyright infringement, requesting that Faucon’s side drop the issue, according to his agency. “I have not, even for a second, thought about taking a legal action against (the BTS side) … I only requested that (the BTS side) admit and mention taking artistic inspirations (from me),” the French artist was quoted as saying.